The 2017 Tree Lighting & Santa Parade! 5:00 pm to 7:00 pm! Vashon's Winterfest Weekend features a First Friday Gallery Cruise, The Artists Studio Tour, Gingerbread Tour & Contest, Merchant Open Houses, Santa Parade and the Tree Lighting Ceremony! 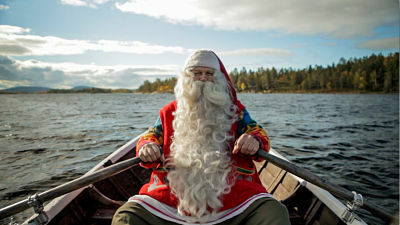 It is a relaxing and memorable way to kick off the holiday season! Join us in the heart of Vashon Town for this beloved holiday celebration. Friday December 2nd, starts off with First Friday Gallery Tour and the 7th Annual Gingerbread House Tour. This Gingerbread House Tour features creative "houses" at 18 different Island businesses. Get a map (click here), take the tour and vote on your favorite! Houses will be up all weekend. The winner gets a trophy! Your vote gets entered into a drawing from fabulous local prizes. Drop of your vote at the ballot box between Vashon Book Store & Kronos by Sunday December 3rd. Saturday December 3rd, Merchants will hold their traditional "Open House". Visit Island shops for unique gifts, see the gingerbread houses (if you haven't done so) and enter to win wonderful prizes with the Beachcomber's merchant open house coupons. Artists on Vashon Island open their doors to the public for the first two weekends of December. Visitors may view artwork in the form of paintings, printmaking, sculpture, ceramics, glass, jewelry, photography, garden art and even more. Pick up a map and visit Vashon's Artist in their studios to see their latest work. A great way to shop for amazing gifts. Click Here for More Info. ROAD CLOSURES! For the safety of all, roads in the heart of downtown will be closed between from 178th Street (Vashon Theatre) to just North of Bank Road by the Thriftway Parking Lot. 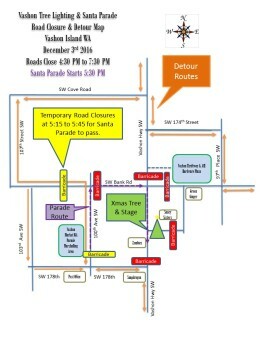 Roads will be closed from 4:30 pm to 7:30 pm. Bank Road will be closed from 100th to 97th. TEMPORARY PARADE CLOSURES: Bank Road from the Fire Station drive way and 100th at the IGA Parking Lot will be closed temporarily from 5:15 PM to 5:45 PM to allow the Santa Parade to pass, these roads will be opened back up after the parade has passes. Please follow all traffic directions and signs. Detours start a Cove Rd on the North end and 178th on the South end. 174th Street will be open, so drivers can get around the festivities by taking 174th, Bank & Beall Road SW.